Now you can give the undead a good thrashing, while on the move. Data East just launched Johnny Turbo’s Arcade: Night Slashers on Nintendo Switch eShop for $7.99. The retro revival is a beat em’ up game with up to three-player co-op. 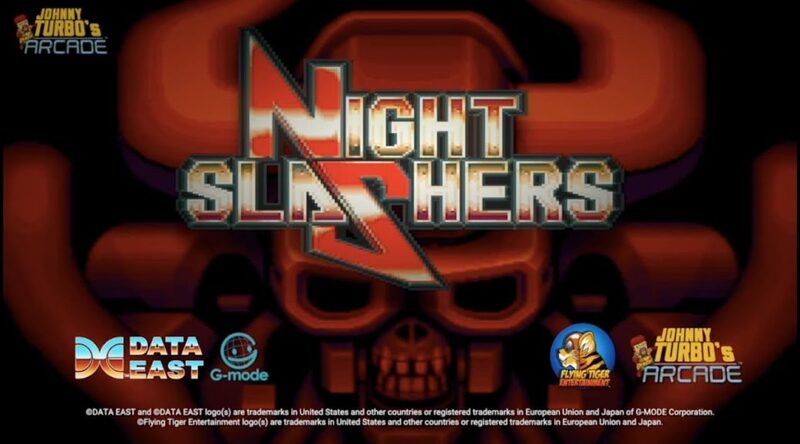 LOS ANGELES, California, November 8, 2018 — Developed by Data East™, Flying Tiger’s Johnny Turbo’s Arcade presents Night Slashers. Originally released as an arcade game in 1993, Night Slashers is a horror-themed side-scrolling beat ‘em up with fighting game action. This is the first time Night Slashers has ever been released on a home console. The world is overrun by monsters, werewolves and zombies. Humanity has little hope of surviving the creatures of the night. Battle the undead, vampires, mummies and even the Grim Reaper himself in order to save earth from becoming a Kingdom for the Dead. There are three heroes to choose from. Jake is America’s most fearsome monster hunter. He uses the power of lightning and has cybernetic arms that are perfect for punching werewolves. Christopher is Europe’s best vampire hunter. Wielding the power of water, he blends both Eastern and Western fighting techniques. Last, but definitely not least, is Hong Hua, Asia’s most revered martial artist. The most agile of the three, she uses the power of fire to fight any monsters that come her way. Night Slashers brings the real arcade feel to Nintendo Switch™! Play with friends and battle hordes of monsters, mutants and zombies together with three-player local co-op. Play funny bonus games such as Whack-a-Zombie and Undead Bowling. Each character has their own fighting style and special abilities. Switch characters whenever you die to try out a different fighting style. Insert quarters with the press of a button for uninterrupted action. Choose between 4:3, 16:9 or filled aspect ratios. Change screen styles at any time. Styles include Scanline, Scanline round, Composite, RGB, S-Video, VHS or none. Night Slashers is launching today for $7.99 in North America.